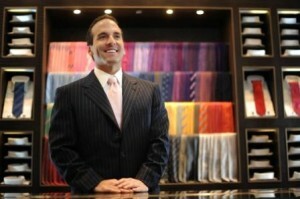 You're Here: Home / Blog / Digital Signage / News / Thomas Pink, New Look and Guess… what do they have in common. Thomas Pink, New Look and Guess… what do they have in common. In-store media helps retailers address the challenging economic times they’re facing by making the shopping experience more enjoyable. Nowadays, there is a richness of tools for achieving this, which goes far beyond the digital visual aspect. I remember the example of a French bakery that decided to spread the scent of fresh baked doughnuts outside its premises in an effort to boost sales and make itself noticed on the busy streets of the French capital. The results were quick and steady. Digital signage is the most visible part of a marketing endeavour meant to influence the mood of shoppers while in store; yet it takes the right mix of other sensorial elements (scents, temperature, lighting) for a welcoming, pleasant environment to be created. 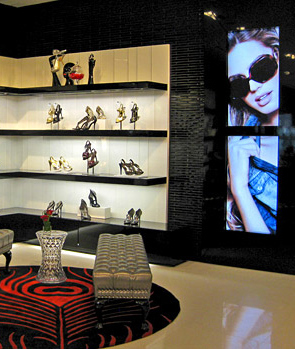 Mood Media, for example, is a company that for 50 years adds a ”chic” element to the stores of retailers around the world. The company created a very British playlist (The Beatles, David Bowie, Corinne Bailey Rae) for the very British Thomas Pink (a high end retailer particularly known for its branded shirts) to enhance the in-store brand experience and create a connection with customers with various musical tastes. New Look’s flagship store in Dublin boasts with offering its customers the possibility to share photos of outfits on Facebook, straight from the changing room. These photos will be later on inserted in the video content running on large MicroTile displays within the venue. Digital signage, social media and music (created by Mood Media’s music programmers) were all aimed at encouraging young female shoppers spread the word about the brand and create a familiar environment that would make them feel they are in the right place. http://www.youtube.com/watch?v=6ZjhrkUhgeA Obviously, the project had an ”wow” effect. The opening of the 9,600 square foot store of the leading fashion brand on Regent Street, London was marked by strong sensorial elements that accompanied the visual ones. Apart from the white and black photography already defining the brand (displayed on large 46” screens, in this venue) the Mood Media engineered scent and music that helped at reiterating what Guess is all about: the bold and the beautiful. Music, in particular, helps at creating a certain in- store athmosphere, in line with the brand’s personality, that customers can recognize from the first steps in. The three examples above show the ensemble of external elements that alongside digital signage play a role in shaping the buyers’ perceptions towards a brand, their readiness to buy and their dwell time. 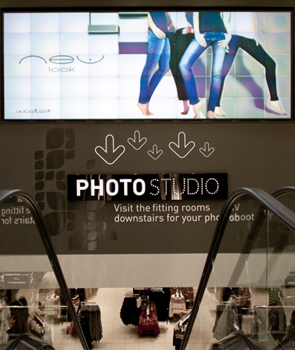 The ultimate purpose of in-store media is making the shopping experience more enjoyable & informative and Mood Media’s groove has definitely brought its high street- retail clients one step closer to the achievement of this goal. P.S. Ooh-tv has just announced Mood Media’s partnership with Gucci consisting in creating music for the brand’s stores in Europe, Middle East, Asia and Australia.